With autumn just around the corner, ladybirds are gathering in clusters on the inside of windows or in corners of sheds preparing to hibernate. They often accumulate in large groups, piled on top of each other, to protect themselves from the worst of the weather. As temperatures drop, their natural food supplies dry up and that's when we see more ladybirds taking shelter in our homes. These charming creatures thrive in a variety of habitats including towns and gardens, grassland, woodland, farmland and heathland. 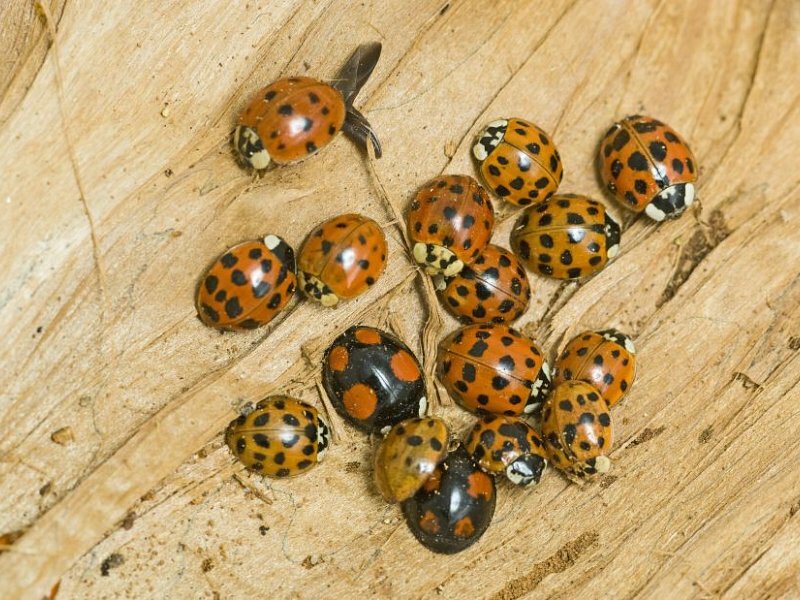 In the UK we have over 46 species of ladybirds, but not all are bright red with spots, some are really quite dull looking and not instantly recognisable as ladybirds. Others have red spots on black or black spots on yellow and the number can vary from 2 to 22. Our most common and best known cheerful little red beetle, the seven-spot, is easily recognised by its red wing cases and pattern of three spots on each wing and one central spot embracing both wings, with a black and white thorax. In recent years, Britain has been invaded by the harlequin ladybird. But please don't be tempted to try to destroy these interlopers if you find a group on your windowsill, as there are often native species mixed in with large clusters. The bright colours of many ladybirds warn potential predators such as ants and birds of their distastefulness. When attacked they exude a yellow fluid called ‘reflex blood’ as part of their warning system. It’s very strong smelling and contains toxins which make ladybirds off-putting to so many predators. Ladybirds love to eat aphids making them a gardener’s best friend, with the seven-spot eating up to 5000 aphids during its year-long lifespan. Please try to resist tidying up flowerbeds until the spring as seed heads, hollow plant stems and leaf litter provide perfect homes for ladybirds to sleep in through the winter. Another way to help hibernating ladybirds is to provide a home for them by drilling holes in a log or block of wood and placing on a wall or fence near to plants in need of aphid control. Advice please – every autumn hundreds of ladybirds make their way up my house walls and settle within the windows and frames. There are native and Harlequin, often a mix of both within the same cluster. If left I’ve found they tend to dessicate so the last couple of years I’ve collected them in a shoebox with dried leaves and scrunched paper and over-wintered them in my shed. Obviously a few die but I find this preferable to having them in the windows (they make quite a mess). Last autumn there were so many more to collect, probably 3x the number. There are also some which found other crevices in the house frame and these are now active. Last year I didn’t release my over-wintered ones till March but I’m wondering if I should be letting them go sooner. I live in East Devon where it is relatively mild but not completely frost-free. Any advice on how I should look after them and when to release would be welcome. Many thanks. It’s still a bit early for them to be active yet – they usually emerge in March or April. Despite the milder weather, there aren’t any aphids about at the moment for them to eat, so waking too early risks death by starvation. It will be best to relocate any active ladybirds to the shoebox in the shed, where it should be cool enough for them to sleep for a bit longer. In March, if the weather seems good, you could open up the shoebox just enough for them to climb out if they want to, and if they do seem to be active you could either leave the shed open for them to fly out, or move the shoebox to a sunny windowsill to encourage them to emerge and be on their way.